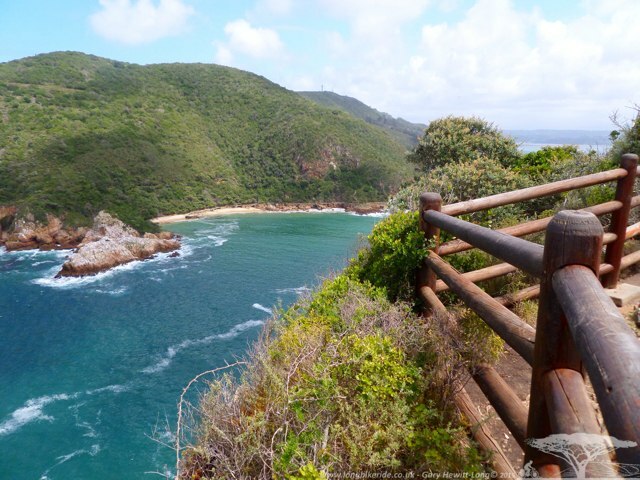 Kenton on Sea was a lovely place but merely a taster as I entered the Garden Route, an area in South Africa on the Southern coast stretching from Storms River to Mossel Bay. The climate seems to change as does the fauna and flora, pine trees being grown for wood harvesting and sawmills giving off a wonderful cut wood smell. Indigenous forests and awe inspiring canyons and rivers. I hadn’t picked the prettiest of routes, but it was pretty enough deciding to stay on a combination of the N2 and R102, pulling off the more rural roads occasionally for faster flatter roads. Riding towards Colchester a car pulled over on the opposite carriageway and enquired as to whether I would like a cold drink. 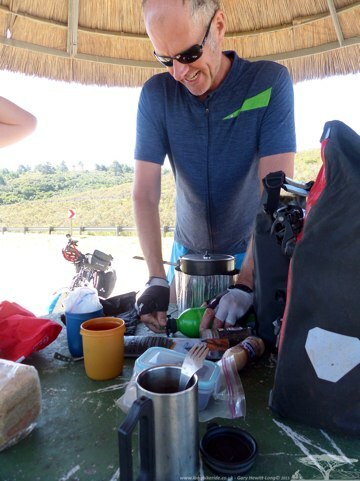 As it was almost 30 degrees and I had been riding for some time I gratefully accepted the offer and made the acquaintance of Nettie and Vic Keeton who gave me some Apple Juice, Polony and a Queen Pineapple! Very kind retired Dairy Farmers who now live near Bathurst. I’d planned to stop at a campsite in Colchester but arrived in the area too early, the riding was going well so decided to carry on to Port Elizabeth. 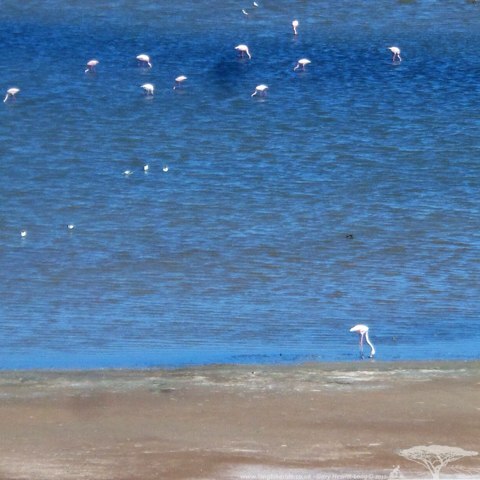 Riding into PE took me past some industrial ponds full of flamingos, albeit in the far distance and not very pink. 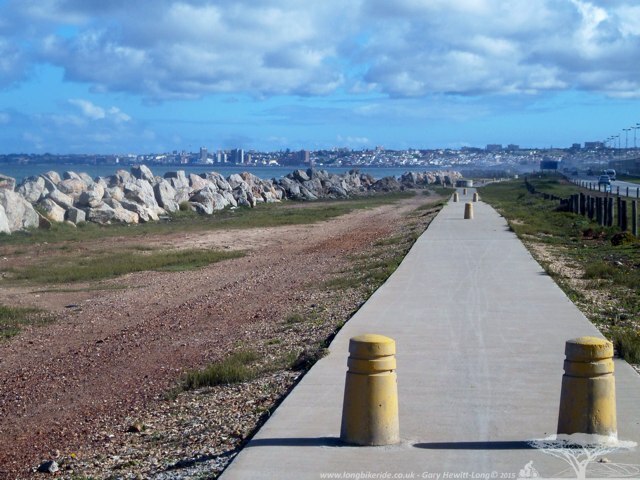 Alongside the N2 running into PE is a path, with many bollards to catch the unwary cyclist or skateboarder. As I weaved through the bollards the sea crashed into and over the sea defences. Put their to stop the sea washing away the shore, the smell of the sea and the cool sea mist refreshing after a long ride. 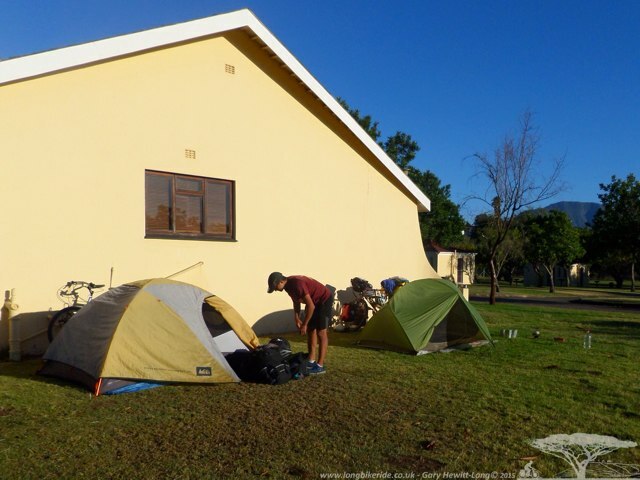 In PE I thought I’d put up my tent in a backpackers, there are many to choose from in PE. The road leading to Hippo Backpackers my first choice took a sudden turn… uphill at about a 27% for half a mile. Tired and sweating at the end of the day I arrived to find Hippo full with lots of young athletes on tour…darn I knew when I was faced with the big hill I should have phoned ahead. I was pointed toward another backpackers, Jikeleza which fortunately was emptier but no camping so I booked into a dorm. Showered and refreshed and with my legs starting to recover I headed out to find food, but was soon way laid after spying a pub over the road called the Barmy Army. 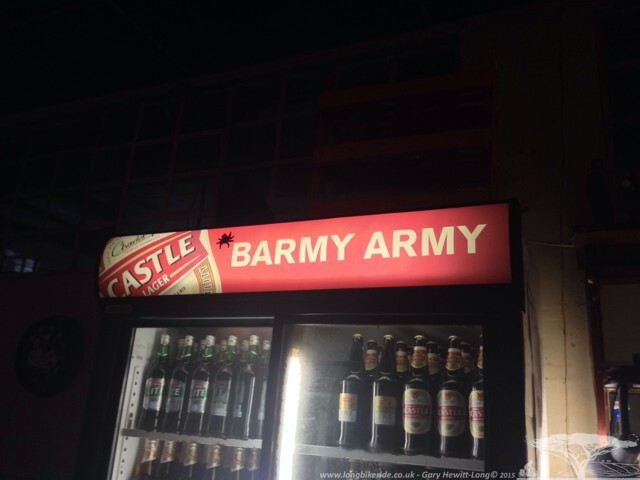 Barmy Army! The firdge didnt stay that full for long..
Talking to the barmaid I enquired “Do you see many English Cricket fans in here?”, “Not really, its all locals” she replied. “Fair enough, Ill have a Windhoek Draught please”. The first drink was followed by several more as the live music was good as was the atmosphere and I got chatting to several people. One very nice guy Greg Hill who from the right angle looked a spitting image of Chris Froome the UK Tour De France winner. Later in the evening the barmaid lent over and apologised, there were no more Windhoek Draught, it seems I had drunk them all so I eventually left on the hunt for food in a Spar shop. Some Soggy chips and a large Russian (It’s what they call a big sausage here, the mind boggles how it got that name) consumed to round off a night of beer was my South African version of pub then doner kebab. In Good old English tradition, I couldn’t eat it all and saved the rest for breakfast. 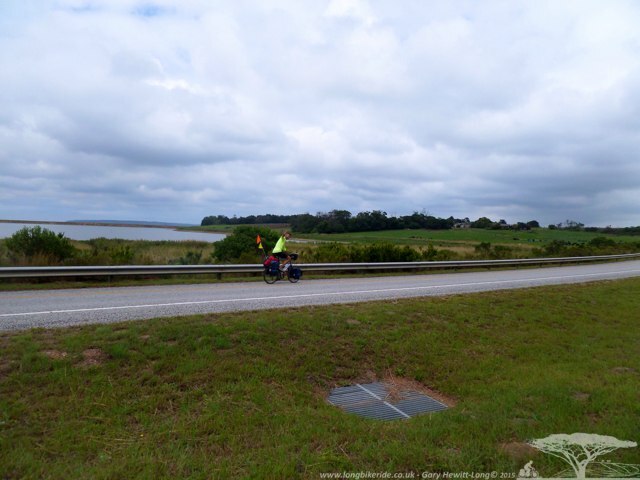 My stop the next day was only a short ride away to a small place called Seaview and a Warmshowers host’s Bennie and Kim Heynike. Just before arriving I spotted ahead two other cyclists loaded with panniers and pulled up to say hello. 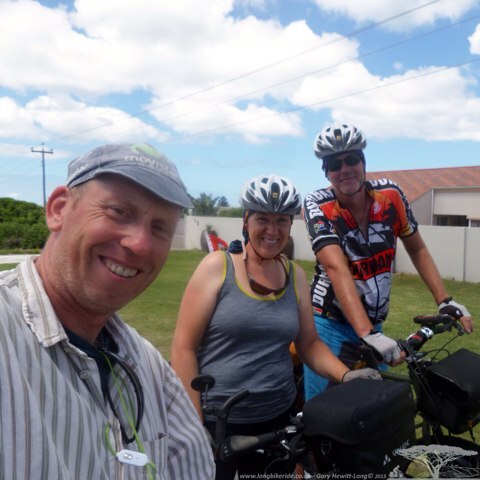 Maren and Ralf from Hamburg, Germany were riding from Johannesburg to Cape Town where they were also entered into the Cape Argus. 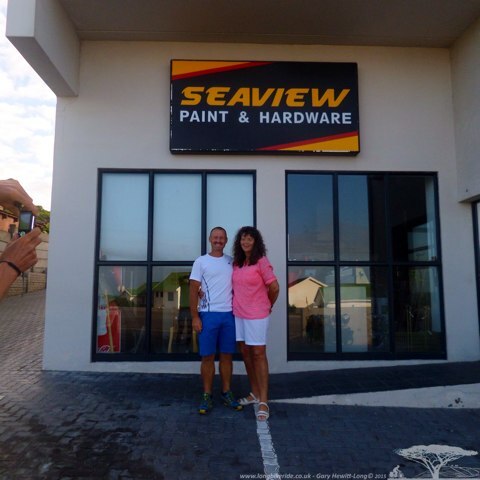 Bennie and Kim own a small successful hardware store in Seaview, looking around the place at stock etc I was surprised to still remember product codes that were used at my previous employers. Wandering around and muttering codes like M0204 and M0137 I may have seemed like I’d lost the plot. 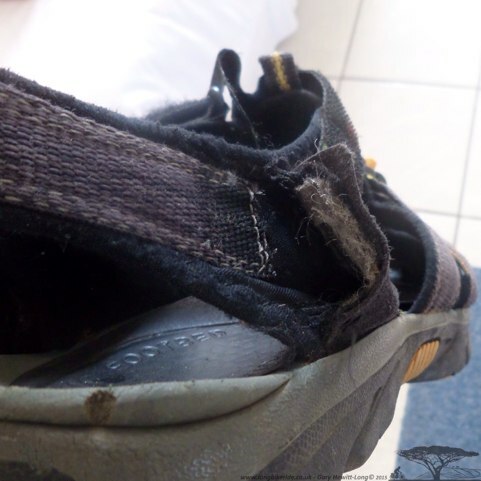 The last 9 months have taken it’s toll on some of my kit, the Keen cycling sandles I had bought for the trip were literally falling apart. With time to stop at Bennie and Kim’s I could set about repairing them, sewing them up with some of the 10lb Breaking Strain Dacron I had brought with me. The Dacron being a supple braided line I used for carp fishing but ideal for very heavy duty sewing. 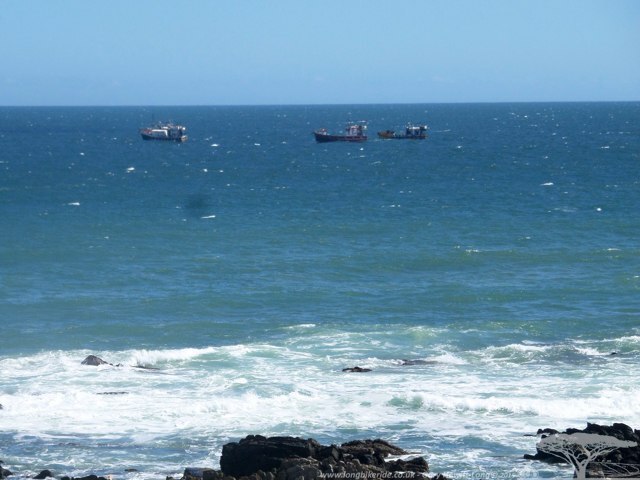 Just out at sea there were a lot of boats, Bennie explained they were catching Calamari mainly for Export. The boats go out to sea for up to 21 days or until full they hold 9 tonnes. The quick regeneration of squid stocks, 1 year from birth to adult they don’t appear to be over fished. The view from Bennie and Kim’s house is breathtaking as the sun goes down. I was treated to this a couple of times. 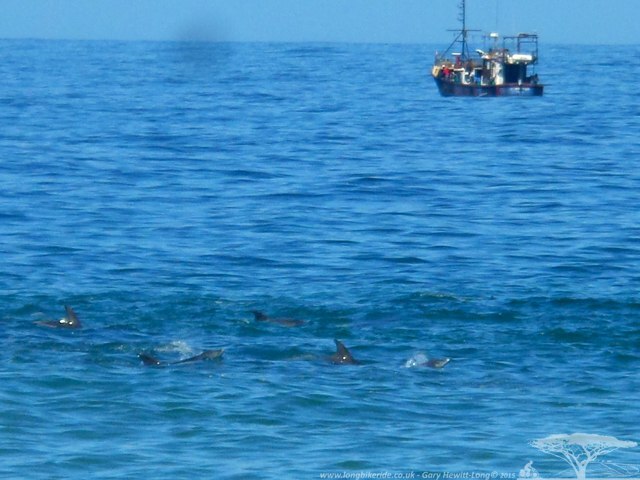 The same stretch of coast is regularly visited by Dolphins. Kim woke me early as a large pod came along the shore. Grabbing my camera and hopping on the bike I tore down the road to get to the coast for some good photos as 6 or more came from the other direction. As the large pod met the small group they turned back the way they came, not arriving where I was waiting. Back on the bike I headed back the way I had come to get some photos just down from the shop. Some of the rocks near where I photographed the dolphins had some graffiti on them, but not your boring scrawl or tag you see in the UK but some artistic graffiti. 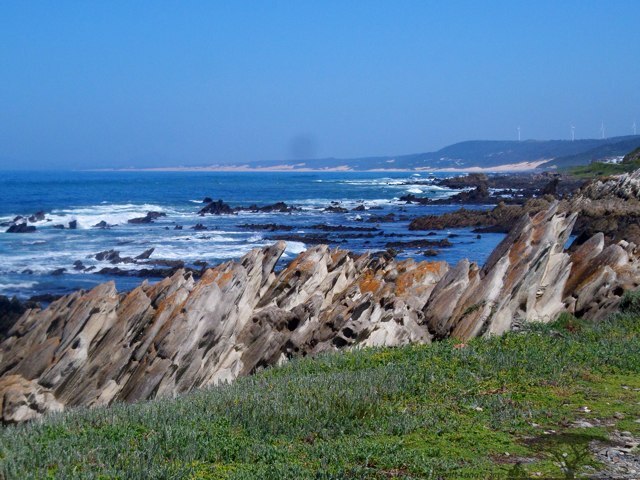 The rocky coastline is unlike anything I had seen before, there are so many pools and wildlife everywhere. If you like rockpooling you could waste hours here searching for fish and other small animals. 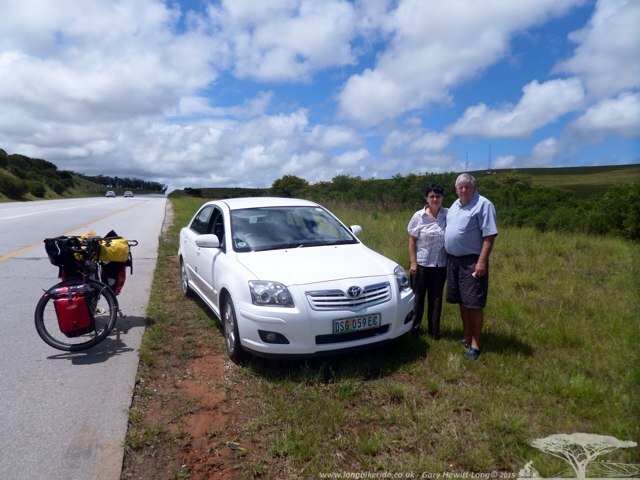 We were about to have another Braai when Robyn, Kims daughter alerted us to another cyclist loaded with bags riding down the road. 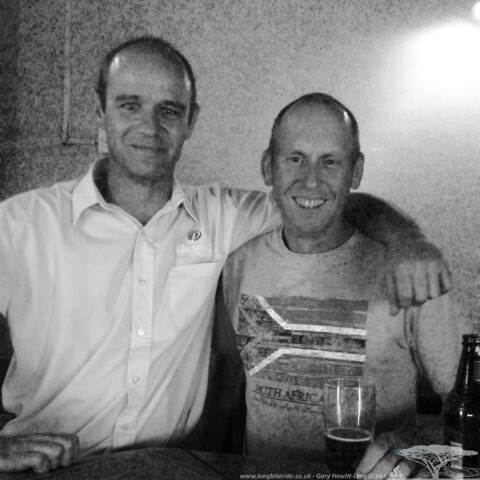 I had heard earlier there was a Frenchmen coming along from PE so Bennie and I hopped in a car and went to find him. Eventually finding the guy a couple of miles down the road, riding fast with a tailwind he’d stopped to ask some locals about camping. We pulled up winding down the window I announced “bonjour monsieur, ca va?”, he looked confused so I asked “Are you French?”, he replied “No, I am from Holland”. Ah.. Ok so explaining that I was a cyclist made him look even more confused. After all I’d just gotten out of a car and was dressed in casual clothing. 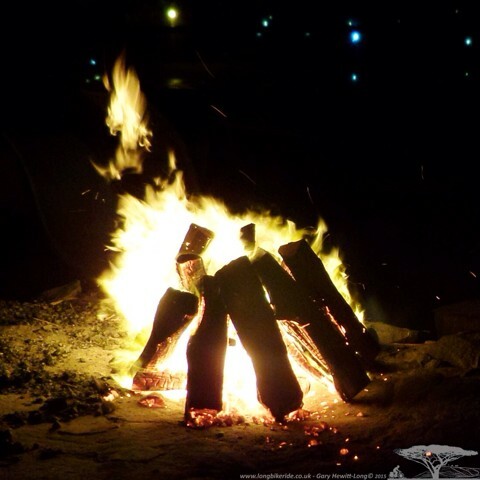 After a while Bennie and I had explained the concept of Warmshowers which Rene the Dutch cyclist had not heard of and he came back to the house for the Braai. 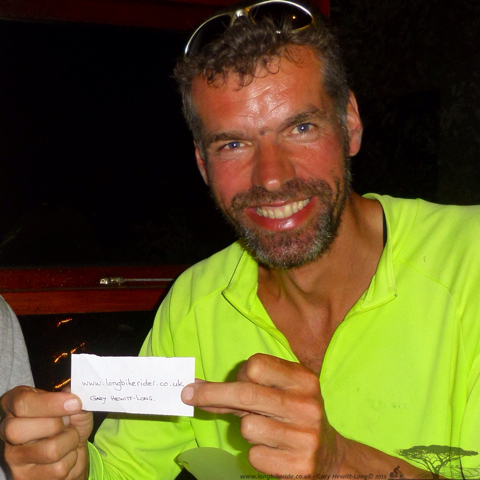 Rene explained there was an Englishman on the route also cycling, but that he would be in Cape Town now and that he had all his stuff stolen. After a bit more of a chat it turned out the Englishmen he was referring to was me! Rene had my name written on a piece of paper with my website address which he had gotten when staying at Pitch Up in Bethulie with Huntley whom I had stayed with a few weeks prior. 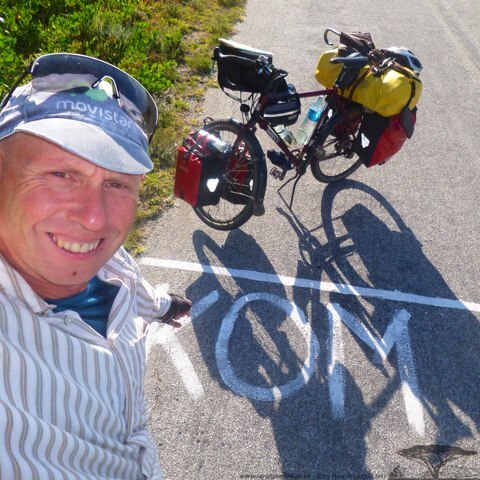 We both rested another day and left together, saying thanks to Bennie and Kim and riding out of Seaview up a long hill. And then down another hill, warm weather, the smell of the sea and breathtaking views are some of the rewards of cycle touring in this area. 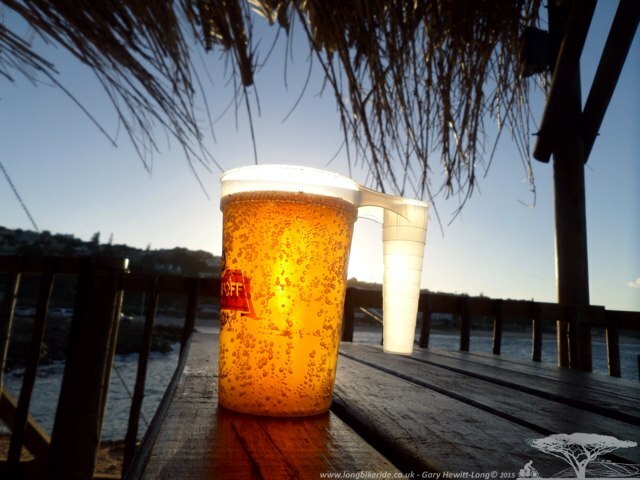 Jeffrey’s bay is a very touristy location, lots of coffee shops, a nice beach and a backpackers. Rene and I arrived there quite early and although originally planned to go further we decided to take the afternoon off and camp early. Island Vibe was 80 Rand to camp and the view from the camping spot worth that alone. On arrival we were told that there was a big group of young girls coming to stay that night. Both Rene and I were liking the idea of that.. the reality however wasn’t quite as good as a horde of drunken squealing teenagers tried to play some odd game involving water and bums until 3 in the morning.. It was even too dark to see any bums! I like roads, Rene likes wildlife so the following day after riding a couple of hours we both wished each other well and headed onto different roads, both heading the same way but taking different routes. Ahead of me a sign warned of a fine of 200 Rand for walking across the bridge. I was on a bike so all was OK. 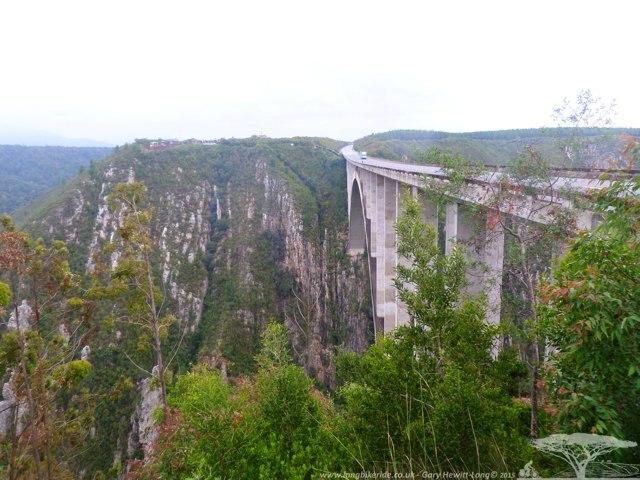 The bridge was the site of the world’s largest bungee jump and yes it was very high. It also happened to be the border between the Eastern and Western Cape. 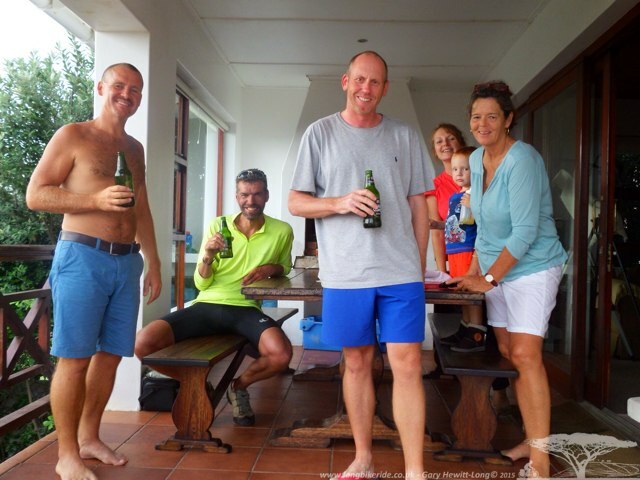 I had another Warm Showers host arranged in Knysna, Peter and Lorraine who I was heading to. 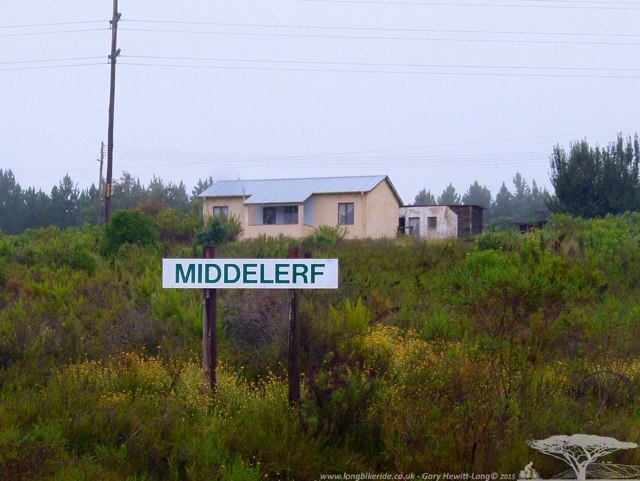 Riding there I came past an area called Middelerf, I looked out for badly educated hobbits who couldn’t spell, but they must have been hidden in their holes. 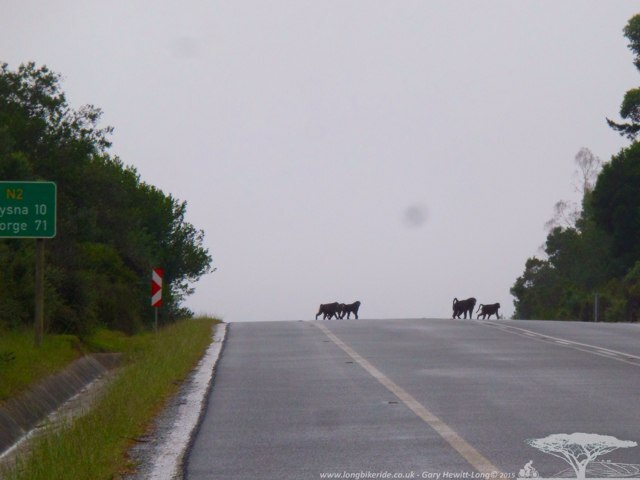 Baboons furtively crossed the road, cleverly making a well worn path at the crest of a hill giving them a good view of vehicles coming from either direction. Why did the baboons cross the road? Peter took me on a quick tour of Knysna showing me the heads, the entrance to Knysna and then down through town and some of the more expensive properties which are worth millions and stand empty for much of the year. Later in the day Maren and Ralf whom I had met earlier in Seaview were due to arrive to stay. 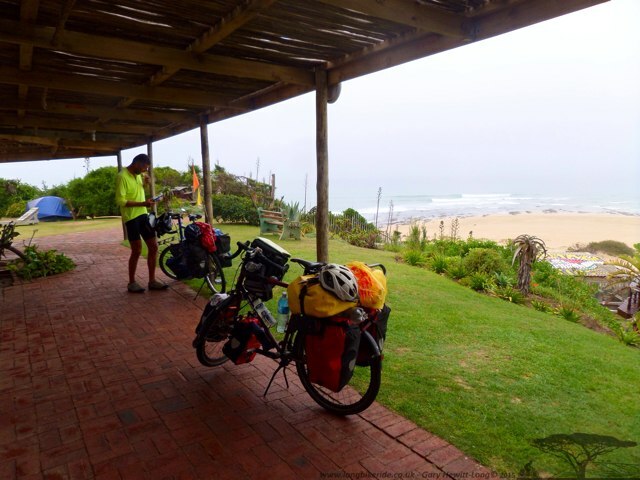 They had stayed with Peter and Lorraine the previous year when they cycled from Cape Town to do a round trip. 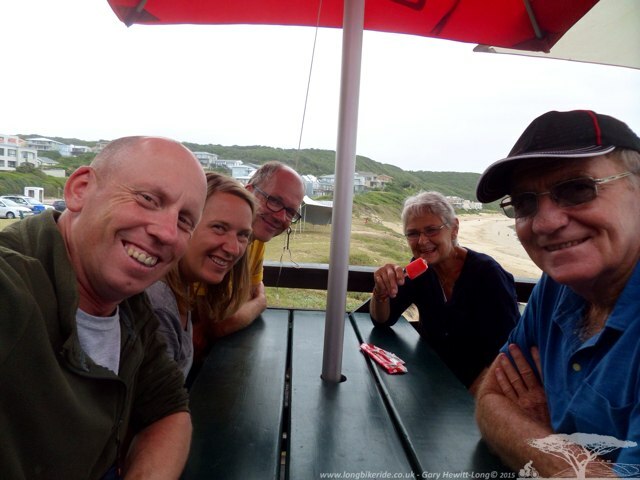 We all headed to Buffalo bay for a coffee. The area having some great waves for those that like to surf. The previous year the beach t Buffalos bay was the sight of a shark attack by a Great White, the first fatal one in a long time. It was interesting to hear many similar experiences from Ralf and Maren. One of the things I had looked for in vain in South Africa was 100% Orange juice. I had been unable to find it and so had they. The Orange juice is labelled as 100% Orange Juice however small words underneath say fruit blend. When looking at the contents it’s mixed with grape or “other” juices. Lorraine was surprised to hear this and confirmed yes you could get 100% Orange Juice. Wanting to prove this by taking us to a local store where we started to hunt the orange juice. After several minutes of fruitless searching we had still not found 100% Orange Juice, it was either blended or had other ingredients.. Lorraine was amazed. The way its advertised in South Africa and the retail packaging make it look like 100% orange Juice, many Europeans read labels, closely.. I have since found 100% Orange Juice, in Spar in the refrigerated section in 2 litre only containers, although it does have some preservatives so the claim to be 100% cannot be exactly true but it’s the closest I have come to it. 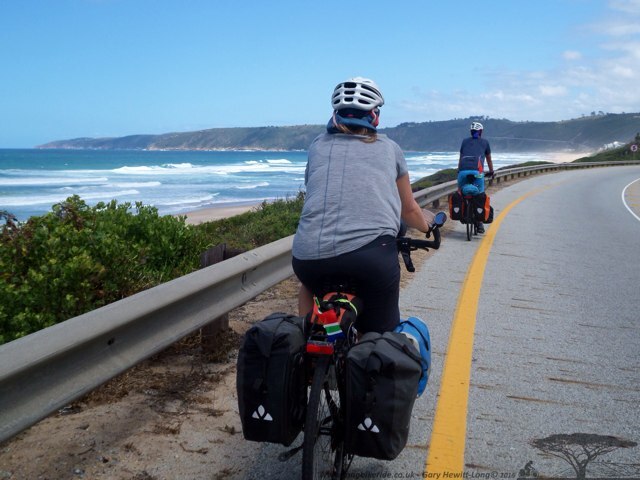 Leaving Knysna I followed Maren and Ralf out of town and we headed toward Mossel Bay. Stopping along the way for a falafel and pancake lunch in Wilderness. 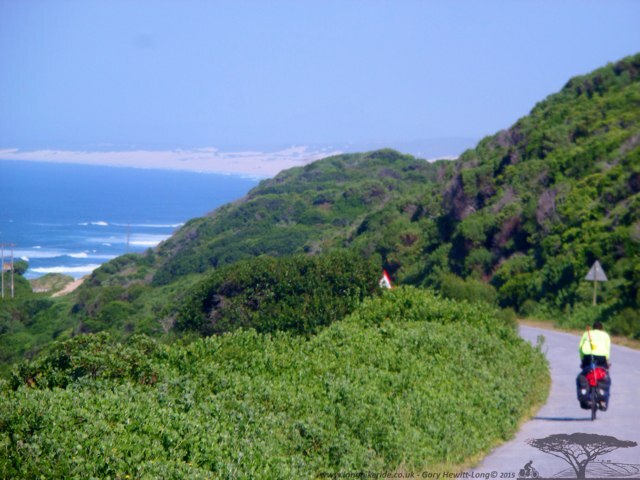 The coastal route making you want to shout “weeeeee….” As you coast down hills with breaking waves and sandy beaches to your left and a fast downhill to the next town. Just before Mossel Bay we decided to stop, I had ridden ahead and eaten a banana when Ralf and Maren pulled in, they asked me if I had the kettle on, which I didn’t so Ralf quickly put his on, battling with the strong wind to keep everything on the table and the flame protected by a normal stove wind shield and several pannier bags. Anything not held down blew away. 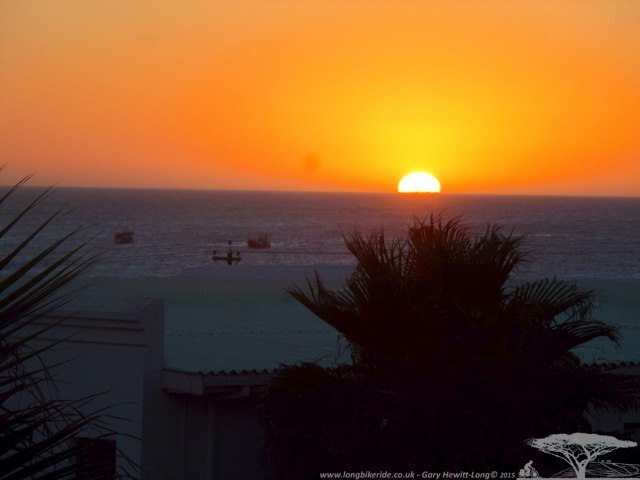 One of the backpackers in Mossel Bay is the Santos Express, a little quirky. It’s an old train turned into a backpackers. Sleeper carriages now static host travellers from all over the world, the quarters are a little tight as you’d expect but with overhead storage the luggage fits well enough and a good shower and clean toilets it made a nice stop. Maren and Ralf booked a double and I opted for a single rather than the dorm after asking how many young girls were staying. I was told lots and wished to have a good nights sleep hopefully with no drunken squealing. The bikes were locked together outside and the overnight guard assured us he would keep a close eye on them. 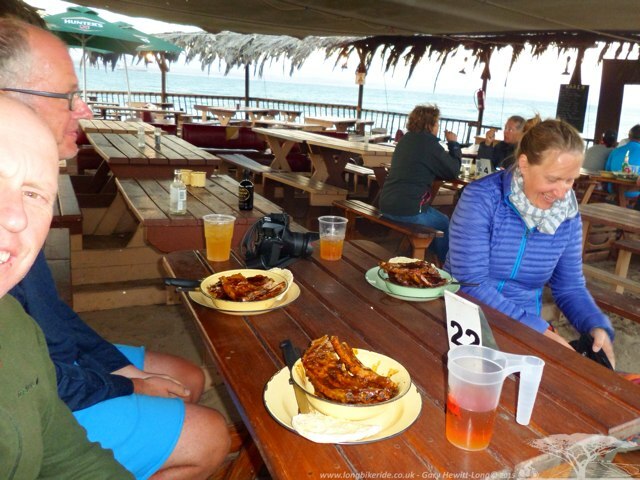 Whilst back in Kysna Ralf had explained that Mossel Bay had a restaurant Kaai 4 where the best Ribs in the world could be eaten, quite a claim so we decided to go there. Actually the main reason why Maren and Ralf rode to Mossel Baya for the ribs, this added another 50 miles (80km) to their trip. If the ribs were worth riding 50 miles for they must be good! We ordered the same, 3 portions of ribs and I tried the local Glenhoff beer, a perfect accompaniment to a plate full of meat. I have to say Ralf was spot on, these ribs were unlike any I had previously had. In South Africa, meat is king, there is lots of it and it’s relatively cheap. A portion of Ribs in the UK is nice but you can always eat a couple of portions. You get so much here, I was stuffed after eating a huge bowl of them. The following day Maren and Ralf headed to Outdshoorn while I continued West toward Cape Town. The scenery changed again as I cycled out of the garden route, more dairy farms with the smell of round bale silage. Cows in fields with little else to eat as slowly the amount of green dwindled, but not completely disappearing. There were many farms with Jersey and Ayrshire’s, unpopular breeds in the UK now as farmers moved towards higher yields with Friesian Holsteins. My map showed a campsite in Riversdale. The site run by the municipality was a little bleak but had everything you needed. 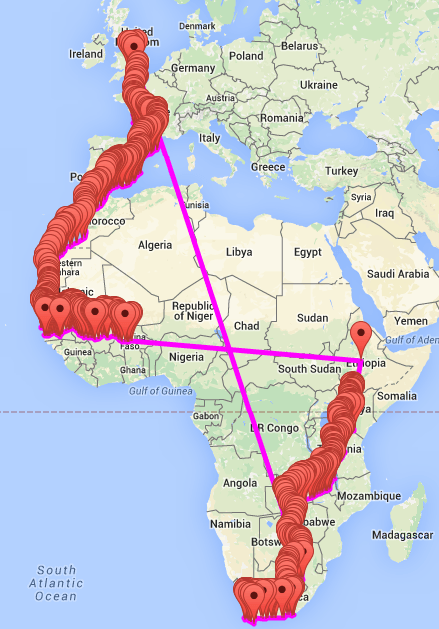 In contrast to French Municipal Campsites, the ones in South Africa tend to cost more. 115 Rand for one night with no wifi or free breakfast or tea and coffee. I explained this was high and showed the man in the office a copy of the free Coast to Coast backpackers guide where you can camp for as little as 75 Rand and have free breakfast, a nice communal area to chill out, cooking facilities and wifi. Interested in my trip I was allowed to stay for free. Later in the evening another cyclist turned up, Nate from Florida. 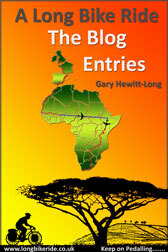 Nate had flown into Namibia and had found it too hot, hopped on a bus to Cape Town to carry on.